Everybody on Sim Earth loves sparkly food. It looks great, it apparently tastes great and it fills Simmy bellies — and Simmy hunger gauges — in half the time that regular food takes. Sure, it comes with the caveat that your Sims will get pudgy in a hurry if you don't cancel their Eat actions in a timely manner, but every rose has its thorn. 3) Stock exactly one foodstuff. 4) Check Food Supplies again. Subtract the first result from the second result. Then That Other Sims Site and its toxic community angered and vexed me a hair too far, so I stormed off and never saw reason to complete the project. But now I'm here, so recently I decided to dig up my old scratch sheets and resume the project. And here's what I've come up with thus far: A list of all the nummies that, in some way or another, can help your Sims cook meals with those delicious and fattening sparkles! Each foodstuff comes listed with how many Fresh Food Points it adds to the refrigerator's reserves when a Sim uses the fridge and Stocks it. That's not an error. Contrary to the misguided opinions of more than one Simmer out there, Stocking fish does not add to a refrigerator's Fresh Food Points! From the measly Largemouth Bass to the fabled Golden Trout, the Fresh Food Points from every stocked fish is precisely zero. Fish doesn't even add to the refrigerator's regular Food Points! How did people get the idea that fish adds Fresh Food Points? I tested that on four of my Simmy households — Benne Evolence, the Covenhearts, the De Chefs and the second Lupina household with Jolene and her ten dogs — and three or four different refrigerator models, two of them being vanilla Maxis fridges. Not a single Fresh Food Point came from it all. But can fishies give you sparkly meals nonetheless? Yes, they can! Instead of using a refrigerator's Stock option, your Sims can either use a refrigerator, an oven/stove/range or a grill and cook the fish directly out of his or her Inventory, via the Make, Make Many, Have Lunch, Serve Lunch, Have Dinner or Serve Dinner options. (No, the Breakfast menus don't let you cook freshly caught fish. Believe me, I looked.) From there, look for either Bass with Squash, Blackened Catfish, Stuffed Rainbow Trout or Stuffed Golden Trout, pick one that's available and your Sim will remove the corresponding fish from his or her Inventory and cook it. If the fish doesn't burn in the process, you'll end up with sparkly food! As far as I can tell, the only differences between regular-sized fishes and Jumbo fishes are regards to how much you can sell the fish for, either sold back to the world (via the Delete key) or sold in a Sim-owned business (as I found out with my Rubinia household and Portia's fresh fish and deli market); Jumbo bass, catfish and trout tend to fetch a few more Simoleons than regular bass, catfish and trout. Otherwise, all seven fishes result in different-looking meals that behave pretty much the same, feeding the same six Sims and filling Hunger gauges just as quickly. I tested this with Jolene Lupina and Gaston De Chef; Jolene had a mix of both types of bass, and Gaston had a mix of both types of catfish, so I set them to Make Many Bass with Squash/Blackened Catfish. When they were done, they had nary a single bass/catfish left — regular nor jumbo — and a Serving Platter for each fish cooked. And the platters all stacked, so I could see no difference among them. But to be fair, each chef burned one platter of fish (despite their Cooking skills of 10), and the burned meals stacked with the sparkly meals. So further testing may be needed, and that means feeding lots of fish to lots of hungry Sims. For that reason, it's also wasteful to cook a fish via Have Lunch or Have Dinner; use Serve Lunch or Serve Dinner instead, and you can get six meals from the same fish — instead of just one meal — for the same amount of time and effort. 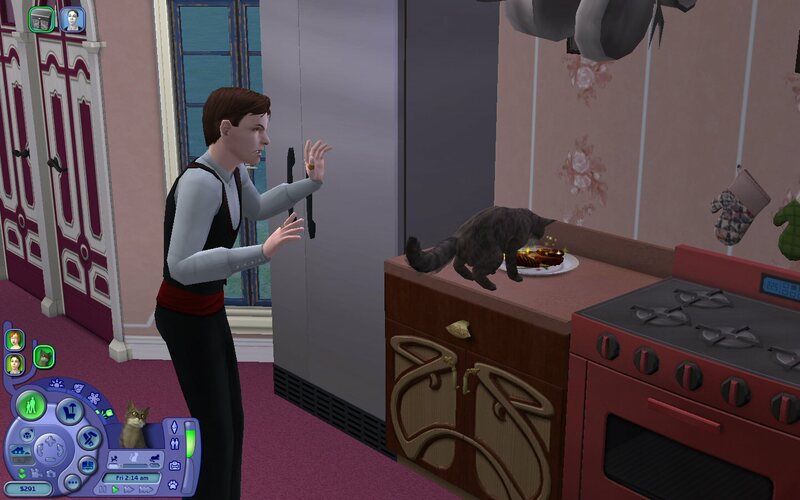 If your Sim's eating alone, just stash the extra fishy plates in the fridge as leftovers and your Sim can eat them later. Bland produce comes from harvesting Sickly plants, Tasty produce comes from harvesting Healthy plants and Mouthwatering produce comes from harvesting Thriving plants. I gathered these numbers from a variety of Simmy households, pretty much any household with a garden at hand. Sacrifices had to be made, of course. "No, no! I can't harvest that cucumber plant yet! I need to let the weeds do their thing until the plant's Sickly so I can see what harvesting Bland cucumbers does! Here, weeds! Let me help you out by overwatering this cucumber plant! Science demands it!" I may have to do a bit more research and experimentation with my Sims, because the season in which a plant is planted, the season in which a plant is harvested and perhaps even the exact day when a plant is planted or harvested may or may not be factors in what you harvest. 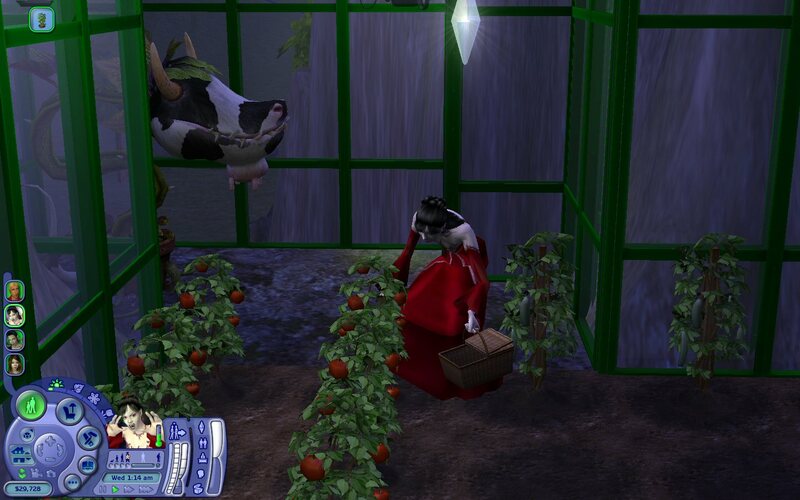 I'd also like to jot down the numbers of fruits or veggies that your Sims get with each Harvest, as well as the number of days it takes each kind of plant to reach fruition; for what your Sims pay to plant a single pepper plant, 1 to 3 Fresh Food Points may seem like a paltry return on the investment until you consider that Sims get about 17 peppers from each Harvest. Still, even the mighty pepper plant can't compare to the eggplant; each Harvest can net your Sims as much as 72 Fresh Food Points, compared to the pepper plant's maximal ballpark figure of 51. Fruits and veggies run through the juicer don't seem to be counted as Fresh Food, but they do fill Hunger gauges pretty nicely, and the fruits' quality may be a factor in this; Eggplant juice squeezed from Mouthwatering eggplants seem to add noticeably more to the Sim's Hunger level than juice squeezed from Bland or Tasty eggplants does. The quality may affect other things as well; Sims who drink eggplant juice from Mouthwatering eggplants almost always get a Skill Point (unless the Sim's skills have all reached maximum), while drinking eggplant juice from Bland eggplants rarely if ever results in a Skill Point...at least from what I've seen so far. Interesting. I always like learning something about the game. I guess that Fish are NOT Fresh Food., huh. Interested in more about food. The bad news about orchard trees: Even if you put one inside a greenhouse, it'll still go Dormant during the winter, so a fruit tree's only good for about three-fourths of the year. (Yes, you can put a fruit tree under a couple of greenhouse lamps in your basement with the Move Objects cheat and it'll still go Dormant. Believe me, I tried.) The good news: Unlike garden crops, orchard trees never die, no matter how much you let the bugs go at them, and no matter how badly you let the tree overgrow. Sure, you'll lose the fruits after the tree goes too far Sickly and resets itself back to Healthy, but you'll never lose the tree itself. 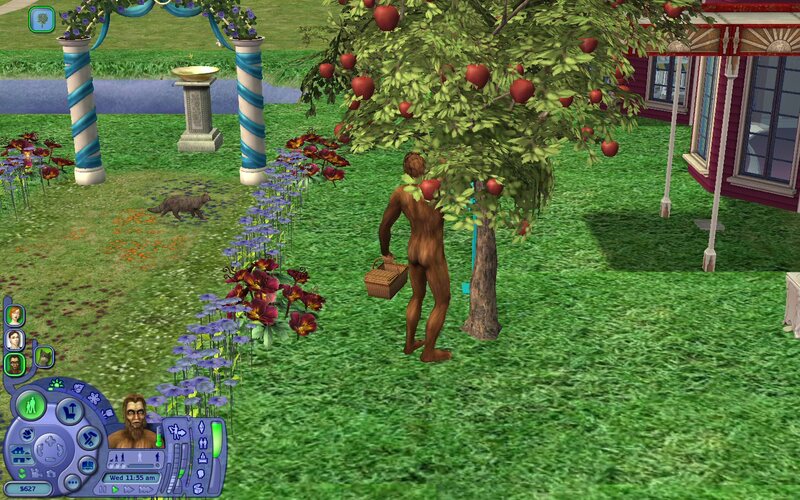 And for 1,200 Simoleons apiece, I expect a little immortality out of my fruit trees. I'm not sure why apple trees cost the same as lemon trees and orange trees, yet apples yield twice as many Fresh Fruit Points as lemons and oranges do. It may be something to do with the number of fruits in each respective Harvest, or the length of each tree's fruition cycle, or the monetary value of each harvested fruit. It may even be something to do with the usefulness of each fruit; run some lemons through a juicer and you get heatstroke-preventing lemonade. Run some oranges through a juicer to get disease-curing orange juice. But what does apple juice do? It helps your Simmy kids finish their homework faster. It may or may not also help Simmy college students finish their assignments faster, but I haven't really tested that yet. That's about it. So apples aren't quite as useful to Sims of other age brackets, and the extra Fresh Food Points may be Maxis' way of making up for that. These tropical fruit trees are considerably more expensive than regular fruit trees; Crusoe Coconut Trees cost $1,700 each, Papaya Trees cost $2,200 and Banana Trees cost $3,400. Why? For one, these trees are never plagued by insects or overgrowth; the downside is that they don't contribute to any Gardening Badges or Nature enthusiasm, but if you're looking for a dependable and steady source of Fresh Food Points, these trees are hard to beat. They still stop bearing fruit when winter comes, but then, they're tropical trees, not evergreens. So it makes sense. I'm not sure why papaya trees cost more than coconut trees; both trees yield six fruits per Gathering, coconuts are slightly more nutritious than papayas (with regard to Fresh Food Points), and consumed coconuts leave hulls for your Gardening Sims to stuff into their compost bins (whereas Sims can eat an entire papaya, leaving nothing to compost). But the banana tree is clearly king of the trio; each Gathering nets both single bananas and bunches of bananas, resulting in an amount of Fresh Food Points that the coconuts and the papayas can't even touch. And eaten bananas leave compostable banana peels, too! No, Sims can't slip on banana peels, no matter how many times they walk across them. Yes, I tried that too. And unlike orchard trees and their fruits, these tropical fruits can be eaten right off the tree! They're good for a quick Hunger boost if your Sims are on the go. But any fruits that they eat directly from the tree are depleted from the tree's daily number of harvestable fruits, so if you're looking for long-term gains, you're probably better off harvesting the fruits with the Gather options and Stocking them in your Simmy fridge for the Fresh Food Points. Sparkly leftovers never spoil so long as they stay in the fridge, after all. Having this package in my game almost feels like cheating! Each Chicken Coop costs $600, and the first egglaying hen will cost you 50 more. If you want to make hatchable eggs for even more chickens (that you don't have to pay for), then you'll need a rooster (bought via the chicken coop for $350). Each Chicken Nesting Box costs $50, but as long as you have at least one hen on the lot, then each nesting box will produce one clutch of Fresh Eggs every day. Nesting boxes can't produce hatchable eggs; that's what the coops are for. 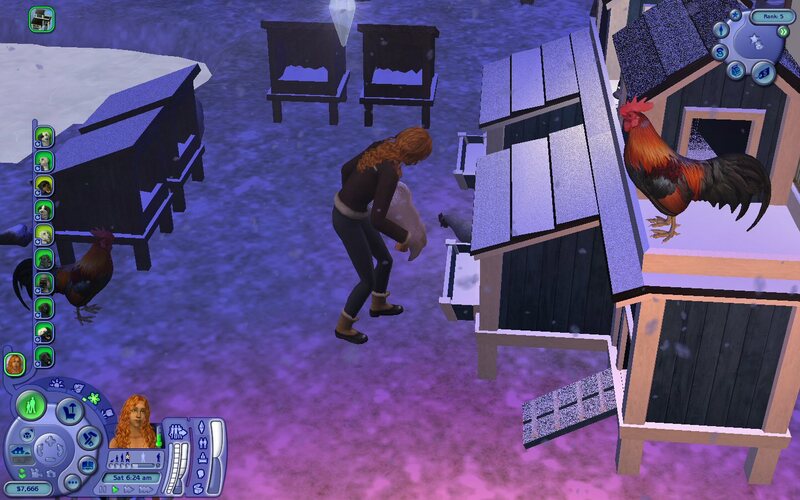 Sure, your Sims have to visit the coops and feed the chickens every day or three, but the chicken feed costs nothing. The hens that your Sims can hatch from the hatchable eggs are pretty valuable too; Jolene Lupina there sells her hens through two of her businesses for $47 each, and that's the Cheap price! Considering how quickly the hatchable eggs can stack up — especially if you have more than one chicken coop — as well as how quickly each bunch of Hatchable Eggs becomes Chicks and then becomes six new hens, it's easy to see why both of Jolene's chicken-selling businesses are very profitable. All you have to do is get past the initial investments, and your Sims can just coast on both Simoleons and Fresh Food Points. Sims can also slaughter hens and roosters for carcasses to Stock in a refrigerator. Slaughtering a rooster results in the exact same Chicken Carcass — and the exact same 12 Fresh Food Points — that slaughtering a hen yields. And directly opposite to real life, roosters cost a lot more than hens do. So, PROTIP: Don't slaughter your roosters. Instead, slaughter the hens that the roosters help produce. Are there any Fresh Food nummy downloads that I may have missed? Let me know! I'll give them a whirl and tally up what I find. (22-09-2018 07:08 AM)lordtyger9 Wrote: Interesting. I always like learning something about the game. I guess that Fish are NOT Fresh Food., huh. Interested in more about food. Well, fish are Fresh Food in the respect that cooking them the right way results in sparkly food, which is pretty much what Fresh Food is. It's just that fishes completely bypass the addition of Fresh Food Points to your refrigerator, that's all. Stock a fish in the fridge and you're effectively throwing it away. At least if you Delete a fish from your Inventory, you get some Simoleons to show for it. So don't Stock fish. I'm always amused by what Sims put into their refrigerators versus what Sims pull out of their refrigerators and cook. "Okay, I packed that fridge with a buttload of tomatoes, to the tune of 360 Fresh Food Points. Now Kiki's cooking up some berry pie. That berry pie's sparkling because it's full of tomatoes, Kiki! That pie has to taste awful! Why are you eating it?" @Pizzatron-9000 You poor simmer, you... wasting all that energy on doing this research. And all for nothing! No, just kidding. It's well done and rather entertaining. I made a few tiny tables that contained all the same info that you've now written a complete encyclopeadia about. Those tiny tables serve me, but they're not as much fun to publish for others to use. BO - NoFreshFood Which does away with the sparkles AND the "Fresh Food bonus", because they are ridiculous. BO - LowerFishPrices Lowers the selling price of all fish. BO - SW-Fish-Packing-Station-Update A similar update to the SimWardrobe Fish Packing Station, for those who use that. EXamine those, and tell us what you think THEN! Important note: The first three mods only really make sense if you use them all together. The last two are only useful if you have those stations from SimWardrobe. But one is still free to use each of these mods separately, although that would create a horrible imbalance in the game. One may wonder why I lowered the Fish prices so dramatically... In *my* humble opinion, no Simmer with even half a brain would have their simmies cook a meal from a fish that they could sell for enough money to buy Food Points that could feed an orphanage and a batallion for several weeks! Every single fish is enough to create a complete "Group Meal". If you check the AVARAGE required NORMAL food points to create such a meal, and then double that number, you come closer to a reasonable price for a single fish. 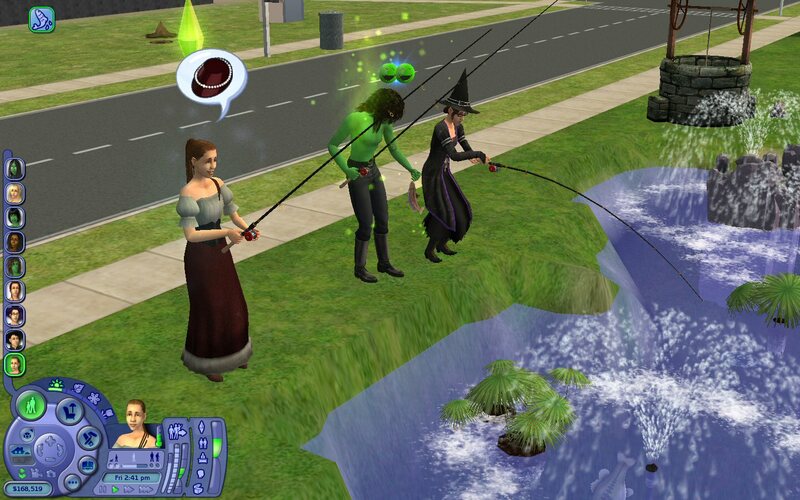 I've had extremely poor sims, who had to go fishing at a pond in a comm lot park, in order to catch themselves a meal. And then those suckers land a Golden Trout that makes them relatively Filthy fornicating Rich! That really destroyed the fun for me. But why aren't all the fish priced the same, then? Well, that's due to the fact that not every fish is as easy to catch. The ones that are less common, should be worth a bit more. As I was reading Pizza's OP, I was thinking about all of BO's food mods and wondering if you'd chime in - and you did! I heartily recommend BO's fixes. The original coding makes absolutely NO sense at all... The chickens are NPCs, right? I don't have them, and I think that is why. No way in Heaven or Hell am I giving up my sparkles. Those sparkles make Simmy meals fun, beautiful and delicious. I don't know about sparkly food making "absolutely NO sense;" I think that Maxis was trying to implement a system in which organic gardens and organic produce are more nutritious (and less threatening to one's long-term health) than whatever mass-produced, hormone-fueled, pesticide-laden fare makes it to the local supermarket. It may not be a perfect system, but I understand and applaud what Maxis was apparently striving for with Seasons, Free Time and sparkly food. (23-09-2018 12:40 AM)BoilingOil Wrote: Your loss, friend. No, no loss. I get to keep my sparkles. So Catherine! What does the "TCJD" stand for?